How does it feel to be in a stadium during a game? Simple: one feels at home. Take the Wembley Stadium, for instance. 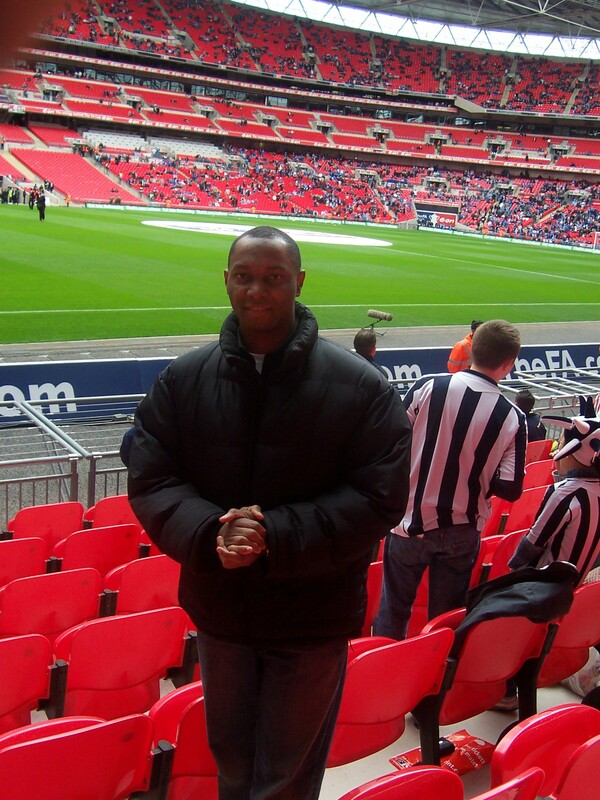 One day while I was at work a friend rang to ask if I would like to accompany him to Wembley to watch the FA Cup semi-final match between West Bromwich Albion and Portsmouth FC. The invite came out of the blues and without a second thought I declined. Even if I had said yes, I couldn’t even go because I had a course to attend same day. Then, as if a scale was lifted from my eyes, the realisation of what I had done hit me. This was no ordinary match I was going to miss—this was a football match in Europe’s second largest stadium (Barcelona’s Nou camp being the biggest), starring Nigeria’s fanciful footballer Nwakwo Kanu. On the spot, my mind raced to his two goals at the Atlanta Olympics in 1996 when Nigeria played Brazil in the semi-final tie, two goals that secured victory for the West African country. I was soon back on the phone to my friend to take up the offer; in any case my course could always be rearranged. So on the 5th of April 2008, which incidentally was the 110th anniversary of the inception of Portsmouth FC, we were speeding on the motorway from Birmingham to North London’s Wembley Stadium. Built at a cost of at about £24 million per mile, the total 115 mile journey, which took in the M6 and M1 motorway, meant we had journeyed on about £2.7 billion worth of motorway to get to the £900 million Wembley stadium facility. At first glance, the Wembley Stadium was impressive. It lived up to the hype as well as the mystic around it. The closer we inched to the stadium the more supporters clad in the colours of Portsmouth and West Bromwich Albion we saw. I felt a rush of emotion as one would feel when approaching a clean and charming beach. Shortly, we sighted the stadium with its trademark huge arch. I reached out for the camera, and as I did, my thoughts raced back to many years back when I was a youngster in primary school, learning about the Scottish adventurer and doctor Mungo Park , who journeyed so many miles inland just to find out in which direction the River Niger flowed. The poor man died in the process and he had no camera to capture the sceneries he sighted on his trip. Thanks to technology, anyone anywhere in the world, with the click of a mouse, can view satellite pictures of the River Niger from the comfort of their homes. The high Wembley Arch was impressive as was the walk up to the stadium. It was spanking new having been completed only in 2007 as a replacement for the old iconic stadium, which was originally opened in 1923 bearing the famous ‘twin towers’. I took photographs of everything. As we walked into the turnstiles the steward pointed at a large plastic drum where my friend had to throw in his plastic bottled drink. No cans and bottles were allowed in the main bowl, as they could be used as missiles by disgruntled fans. Good thing my drinks were in my pockets. A short time later, after I’d made a quick dash to one of the 2,600 toilets in the stadium, we were in a section of the stadium surrounded by West Bromwich fans as our tickets sat us in that part of the stadium. Walking into the main bowl was quite impressive. The retractable roof was out of the way, letting the sunshine in. The loud music from the public address system added to the excitement of the occasion. Being in a stadium generates a feeling that can never be replicated at home. You eavesdrop on the knowledgeable supporters around you who know things that the TV pundits don’t. There is so much passion from life supporters that makes your corner of the stadium unique. I hoped that we had no foul mouthed angry supporter though, as I didn’t travel all this distance to hear 90 minutes of swearing. Anxieties were all allayed when people took their seats around us. Everyone looked liked they had a brain that was in good working order, (although you never know till that first half whistle is blown). Soon we had some members of the army march out to loud applause and they were soon followed by the teams who filed out of their obligatory warming and stretching session. I had to remember not to clap too enthusiastically when the Portsmouth players emerged due to our sitting arrangement. By now nearly all the seats were taken. The Portsmouth players all looked quite gladiatorial in physique and focus as they ran out. Sylvain Distin, Sol Campbell and goal keeper David James. They gave the impression of athletes who could play any sport: rugby, wrestling, boxing, whatever. For a reason I could not fathom, Kanu Nwankwo was about the last player to sprint into view with a slow, uninspired pace and a completely uncharacteristic gait for a top flight footballer that he was. His stride and outlook lacked the grace and fire I had expected. Rather it was more of a gangling , flat footed stroll executed with the agility of a man encumbered with three sacks of beans across his shoulders. I then looked at the West Bromich Albion defenders, their fierce looks and trunk-like thighs and I began to fear for Kanu’s legs. There were 83,584 fans inside the stadium and there was a loud roar when the referee for the day, Howard Webb, blew the whistle for kick off. Despite the huge crowd, the stadium is so well designed that you never feel cramped or crowded in at any time. As soon as Kanu got the ball, I instantly understood why they called him Black Magic in his Ajax days. The crowd watched to see what his next move would be and surprisingly enough, the Westbrom midfielders watched like spectators and he moved and advanced as he wanted. Frustrated fans screamed for a tackle to be put in, but no player likes to be ‘disgraced’ which sublime skills on live TV, and so they played as if hypnotised by Kanu’s boots. I concluded that this was not football but some kind of psychological game requiring another name. I must confess that Westbrom had the upper hand for most of the game but they didn’t take their chances. Then it was half time and we all went to queue for the toilets, wash our hands and buy expensive snacks. The first stadium I frequented was the Nigerian National Stadium in the Surulere area of Lagos and I was particularly impressed with the way the players emerged from their dressing rooms from an underground opening quite close to the pitch. I grew up wondering what a dressing room might look like. I had to wait till 2002 to see one and it was while I was on a tour of Aston Villa Football stadium, which was quite impressive even though empty at the time. During the 2007 season, I worked with Birmingham FC‘s reserve team and we played the occasional match under flood light at St Andrews Stadium when important reserve teams such as Arsenal came down for games (The English Football league system consists of a hierarchical format of clubs, stating from the Premier league to the Championship division and then leagues one and two). Leaving the dugout and walking back to the dressing rooms gave one a strange feeling that life had turned full cycle, especially as you watched the kids in the stadium with their eyes fixed on you as you trooped to the dressing rooms with the players at half time. Half time was usually busy, especially for the physiotherapists who had to strap up any bruised or sore body parts. Food was laid out and the tired players caught their breath. Anyone who works for a football club signs a confidentiality clause, which bars you from taking about what you heard or saw in the dressing rooms; knowing what I know, it is a good thing the cameras never roll there. As we returned to our bright red comfortable seats, which incidentally gave you more leg room than an economy commercial flight, I wondered if Harry Rednap had taken Kanu off the starting line up. That would have made my trip a wasted journey as I had come mainly to see him score. I was relieved to see him jug into view for the start of the second half. He scored at about nine minutes into the second half. All the West Brom supporters around me looked glum and I had to summon all my acting skills to look glum and disappointed at the goal while I was rejoicing on the inside. The electronic display boards flashed the scores, drawing much more applause from the Portsmouth fans. From then on it was a nervous wait for the final whistle. Kanu was taken off about 10 minutes to the end of the match and he received a wild, enthusiastic cheer. Incidentally, Kanu was an Ex- West Brom player having been with them from 2004 to 2006; I know that football fans usually live in fear of ex-players, especially during important games. At final whistle one of the wonders of modern stadium design was on display: the huge crowd dispersed in a moment. And three hours after the match had ended, I was back in Birmingham. Such a Gentleman you are! Love connecting with you and Nigeria. Thank you. Fantastic piece! Now, if I get a chance, I’ll like to see a match played live.